Wednesday’s Inclusive Story Time is currently on hiatus. Keep an eye on our website to find out when it will resume! DIABLO FOODS FOUNDER ED STOKES AT ST MARY’S COLLEGE. Crafts at Circle Time – we are going to make cards for Valentine’s Day after we have listened to some stories and sung some songs. We are closed between 1pm and 4pm as Bel will be attending the memorial service for legendary Lafayette resident & Diablo Foods founder, Ed Stokes. Valentine’s Crafts all day, from 11am – 4pm. Mindful Mediation for Grown Ups, 6.30pm. Mindful storyteller & strategist Sonia Lunacek, who specializes in creating meaningfully engaged communities will lead us in 30-40 minutes of breath work and gentle movement. This is a free event, but sign up is mandatory. Ping Bel to reserve your space. Parenting and Emotional Growth Book Party, lead by Gabriela Bronson-Castain who is a clinical psychologist providing consultation and counseling for children, adolescents, and families at Summit Center and in private practice. Gabriela, who believes a ‘shared wisdom’ can be cultivated through family intervention and support, also holds medical staff privileges at UCSF Benioff Children’s Hospital Oakland. She will be leading a conversation about useful parenting and emotional growth books. 6.30pm-7.30pm, grown ups only. This is a free event, but sign up is mandatory. Ping Bel to reserve your space. Saturday, March 2nd, 2:00pm to 3:30pm – So You Want to Write a Book? Four local writers, members of the California Writers Club, Mt. Diablo Branch, will discuss their writing and publishing journeys and offer tips for aspiring writers. A Q&A session will follow.For further information, check out our website or talk to Bel. A new class for Mommies and/or Daddies and their baby (0-9 months). Learn to connect with your baby through touch and feel lead by local children’s physical therapist Trish Brown. Trish has been a pediatric PT for 28 years and studied at UC Davis and Mt St Marys college in LA. She currently works with the Regional Centre of the East Bay and the Lafayette School District in Early Intervention and Preschool Intervention. SIGN UP CLASS, maximum five babies. No older siblings so that you can concentrate fully on your baby. 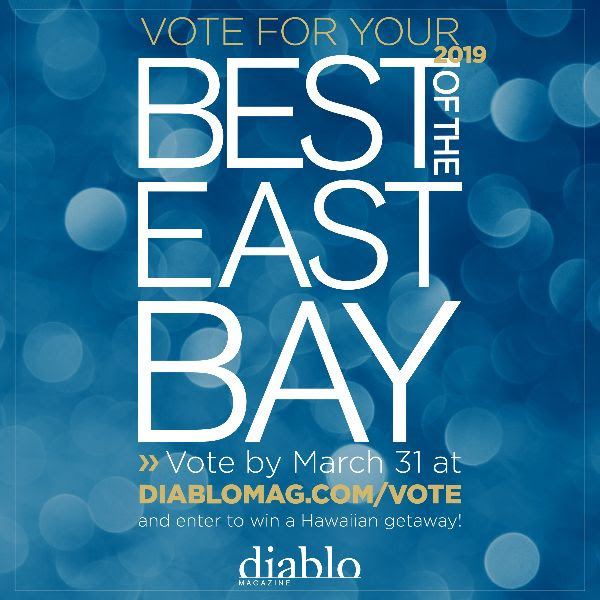 Diablo magazine’s Best of the East Bay 2019 voting is now open and you can show some love for your favorite local businesses here. We are eligible for votes in the categories for Kids: Birthday venue; Kids: Other and Shops; Bookstore, and would really appreciate it if you could take the time to support us, and the other local independent businesses that you visit in the East Bay. Thank you for taking the time to do this.